Offering meticulously designed complete, integrated solutions, a KOHLER® Suite features a wide variety of thoughtful European designs that have been meticulously crafted for India and textured finishes to create the completely coordinated bathroom your perfection loving self will adore. End your search for the timeless with Terrace®, a classic design that will never fade away with time. Designed from a series of insights we uncovered during extensive research surrounding modern styling spaces and today’s evolving grooming rituals, Terrace® blends time honoured forms with innovative technology, creating a fascinating design that transforms your bathroom into something beyond the mundane. An ideal collection for the modern home, it adds both a functional design element as well as artful architectural detail. 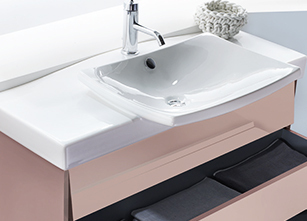 A veritable work of art, Terrace®’s trademark L-shape vanity top redefines luxury of form while the cutting-edge technology of the patented free drain system and co-ordinated elegant roomy cabinets, make it the epitome of modern design. A celebration of the simple beauty found in clean lines is the best way to define the Reve ensemble. Drawing on the minimalism and utilitarian essentialism of Bauhaus design, each individual piece of the ensemble is pared down to its essentials with a clear elimination of ornamentation and purely decorative elements. Reve combines geometric shapes to create sculptural forms that reveal the full extent of their unique character over time. Its bold geometric shapes and clean, crisp lines make it a work of art that offers simplicity and warmth to classic and contemporary bathrooms alike. Featuring a water-saving Dual Flush toilet and an array of lavatories and vanities that deliver modern functionality, together, the Reve range is art at its finest. 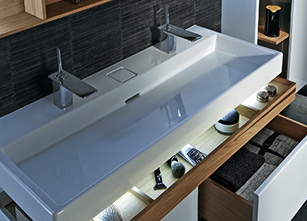 For those who crave wide open spaces, the Escale® Suite by Kohler is ideal choice. Taking its inspiration from a sail boat, the suite’s uninterrupted lines and wide unbroken surfaces give an open feel to your bathroom. The suite contains complete solutions for bath and powder rooms to create a light, modern look with a wide range of mix-and-match coordinating products, including basins, toilet and select bath furniture. 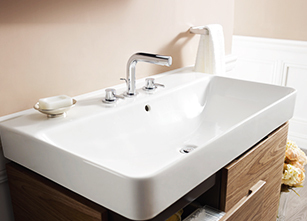 Its well-balanced form and smooth contours take your bathroom from the ordinary to the truly sensational. The distinctive profile of the Escale® vanity top basin not only portrays a classic design but its sleek, modern functionality also offers a convenient and subtle storage options. 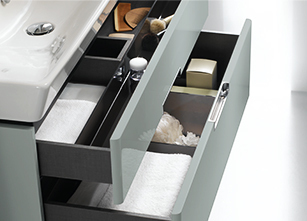 One of the highly distinctive features of the suite are the cabinet storage options, which when coupled with stylish basins combine flexibility with utterly luxurious design. Crafted in wood textures and mellow finishes, KOHLER®’s Forefront range brings in the best of the outdoors to breathe natural simplicity into your bathroom. Featuring clean edges and rounded corners, the range epitomises a harmonious interplay between nature and design. Each individual piece has been crafted with sculpted and flowing lines, the result of many conversations with our architect and design partners in our endeavour to create a design suite that felt equally contemporary and approachable, blends beautifully with the surrounding decor. A fusion of pure and delicate shapes, KOHLER®’s Forefront basin pairs beautifully with contemporary vanities, just how the world was meant to be.